Most items you will need for your holiday are automatically included in the van hire. The following extras can also be supplied if requested at time of booking. Prices are listed on our hire rates page. This is strongly recommended as the awning can be left on your pitch when you go out each day and used to store most of your equipment, as well as greatly increasing your living space. Our Khyam Motordome Classic awnings, offer state of the art quick erect technology using poles which stay attached to the canvas and fold out (umbrella style) to complete erection within 10-15 minutes. This is the perfect choice when touring, or in winter when you may need to set up or strike camp quickly. The separate inner sleeping tent with built in groundsheet can provide a generous double berth for sleeping, or just be used for storage to keep your van free of bedding and luggage when you are out in the Bongo. Families or larger groups will appreciate the huge capacity of our rear trailer. Fully enclosed with high sides and access lock this trailer will provide secure storage for the awning and equipment supplied with your van, plus some or all of your luggage. This will leave the maximum cabin space available for you on your journey to and from site, or on an overnight stop if you decide not to erect the awning. Towing is simplicity itself and no special training is required. As with all towing vehicles speed limits are restricted to 60 mph on motorways and dual carriage ways, or 50 mph on regular roads. However, these limits allow you to relax and enjoy your journey, and will also give maximum fuel economy. If you need more space for rear passengers or luggage when driving (or if you take the optional awning) we can fit a Thule rear luggage box. This attaches to the tow-ball and holds upto 400 litres of lightweight equipment, leaving maximum space for you and your family in the van. The box adds around 1 metre to the overall length of the van for parking, but can greatly add to enjoyment of your holiday by keeping maximum space free inside the van. Attaches to the rear towball and carries 2+ bikes. Please note this cannot be used in conjunction with either the trailer or luggage back-box. Given that this is an either/or choice most hirers will find it better to have the extra luggage carrying capacity, and simply hire bikes at local centres when required. If you want more details of local bike hire centres in Wales please ask us for suggestions. 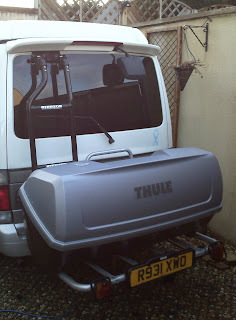 Full stainless steel roof bars with double width foam pads, suitable for carrying surfboards or windsurfers. A step ladder can be provided to aid access if required. In addition both our vans come with insulating window covers for the windscreen, front side and rear windows. With all home comforts included, holidays are not just for the summer any more ! Most hirers prefer to bring their own bedding and towels. However, if you wish us to supply them please state your requirements at the time of booking, and we will include as extras. We can supply Karrimor 2/3 season sleeping bags if required. Our standard hire fee includes insurance for one named driver. Cover for additional drivers is available for a small daily charge. All drivers must meet our insurance requirements. If you are not driving to our base we can advise on taxi transfers from main line train and bus stations in Newport, or Cardiff in South Wales, which offer regular connections to UK airports.